Steve D. Sims grew up in a construction family in East London. Not wanting to spend his life working as a bricklayer, he talked his way into a stockbroker job in the 1980’s in London that lasted about six months, before he again talked his way into a job – one he was not qualified for – in Hong Kong, which lasted 2 days before he was fired. So Steve started working the doors at the Hong Kong nightclubs, quickly gaining a reputation for being the guy that can make connections, including events, tickets, introductions and more. His initial goal in making those connections was landing a high-level job, but his wife Clare realized he was doing well using his talents, suggesting he create his own job. So he did just that. Within a few years, Steve had a booming business in Palm Beach, Florida. CEO and Founder of the super exclusive, membership only personal concierge service for VIPs and executives seeking the ultimate in unique experiences and travel for themselves and their companies, The Bluefish, Steve Sims is an unlikely expert marketer within the luxury industry, whose secret to success is that he’s built a life out of keeping his word, and not taking no for an answer. Steve is known as “Wizard Of Oz” to the world’s wealthiest celebrities, professional athletes, and successful entrepreneurs. Steve is the go-to guy to make anything happen when “no” isn’t an option and money isn’t an issue. Profiled and often quoted in international publications including the Wall Street Journal, Forbes, London’s Sunday Times, and more, Steve is a sought-after speaker at many prestigious organizations such as the Pentagon and Harvard. Whether someone wants to sing with a favorite rock star, have lunch with Donald Trump, get married in the Vatican, or dive to the wreck of the Titanic, Steve Sims is the guy who gets to yes when the answer for anyone else would be no. 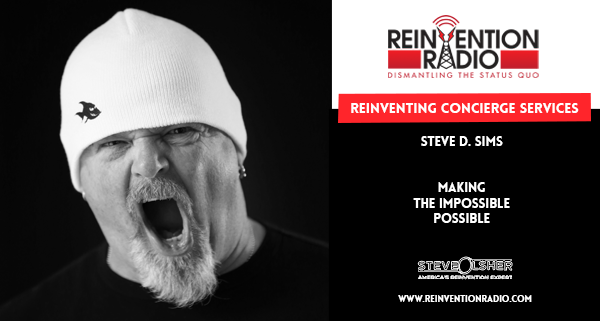 Tune in to hear Steve chat with Steve, Mary, and Richard about reinventing concierge services and how he makes the impossible, possible. Reinventing Guest Blogging – In this episode, tune in to hear Sharla Jacobs chat with Steve, Mary and Richard about reinventing sales conversations and attracting new clients through Heartselling.